24 October 2018 – Yangon, Myanmar: The largest global sports media property in Asian history, ONE Championship™ (ONE), recently held the official ONE: PURSUIT OF GREATNESS Face-Off and Media Open Workout. The event took place at Junction City on Wednesday, 24 October. 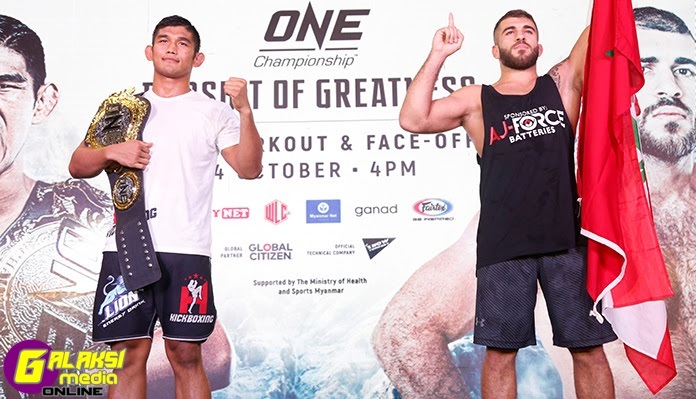 Facing off for the very first time ahead of their upcoming main event spectacle were ONE Middleweight and Light Heavyweight World Champion “The Burmese Python” Aung La N Sang of Myanmar and the challenger Mohammad “O Lutador” Karaki of Lebanon. Other athletes set to perform on the card were also in attendance.